A party of six German aircrafts touched down on Skye. Visitors flock to Skye in their numbers during the busy summer months, usually travelling by road or ferry – but a group from Germany arrived in different fashion over the weekend. 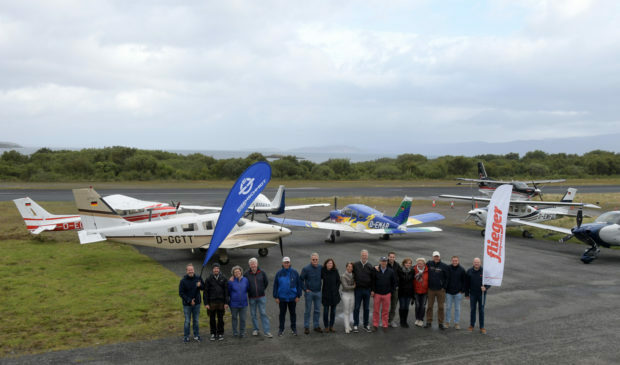 Seven German aircrafts touched down at Skye Aerodrome near to Breakish as part of a trip organised by Thomas Borchert of the Aviation from Aero magazine. The party, including six pilots and their passengers, stayed locally and were transferred to their hotel via taxi before departing mid-morning on Saturday. A Cessna 172, Piper Warrior, Piper Arrow, Cirrus SR22T, Cessna 210, Piper Seneca, and a Quest Kodiak were on show at the Aerodrome on Skye where the travelling party were greeted by Richard Gerring, the Highland Council’s transport planning manager, who liaised with the group to ensure their arrival was possible.